When it comes to the safety of workers out in the field Janet Waine is one of the experts having worked in the industry over 20 years. So much so that earlier this year she stepped away from Showers & Eyebaths Services, following its acquisition by the American Justrite Group of companies, to start her own safety shower manufacturing company. 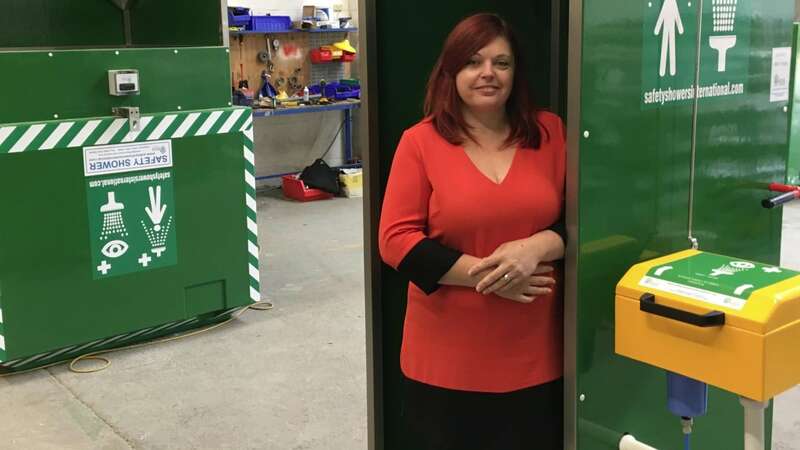 Called Aqua Safety Showers International, Janet’s company is very clearly flying the flag not only for British manufacturing and exporting but also for women in what is still considered to be man’s world. Janet remains undaunted by the task in hand. Along with head of sales Jen Gerrard, who was also previously at Showers & Eyebaths, and a comprehensive manufacturing facility based in Greater Manchester, she is already filling her order books and is on target to achieve £1/2 million turnover in her first year. “I have a very clear understanding of what the market requires when it comes to safety showers,” said Janet. “It isn’t just about the end product. You have to be able to recommend and advise operatives working in extreme conditions in the best safety shower solution to suit their worker’s needs. It is surprising how many people believe that a safety shower works on the concept of a domestic shower. And when we talk about extreme conditions, we are talking about ensuring safety showers operate in temperatures from plus 40 degrees centigrade, as currently being experienced across Europe, down to minus 40 degrees centigrade. You then need to deliver the solution on time and on budget whilst also ensuring clear and constant communication. After that it is important to help customers with advice on installation and maintenance as a safety shower has to work first time every time. “We are dealing with different cultures, different certifications, different hazards, different environments; there is no one-fits-all approach which some competitors offer. We understand the business and the specifications given on different projects. My sales team and I now have the flexibility to adapt or modify our designs whilst still remaining competitive and profitable. This was always the frustration we faced when working within the confines of Showers & Eyebaths Services. Aqua Safety Showers International currently manufactures several safety shower solutions including self-contained tank showers, mains fed showers and stand-alone remote tanks. The company is gradually building up a distributor network covering Russia, the Middle East and Europe. Impressively, from a standing start, deliveries have already been made and orders are coming in on a steady basis. The design and manufacturing of the products, which takes place on the premises, is headed by Janet’s engineering husband, Mike. “We actually work well together. Mike was also manufacturing at Showers & Eyebaths Services and I think he quite likes to now have a considerable degree of autonomy be able to engineer his ideas into the manufacturing procedures. He is constantly looking at ways to develop our products to better meet the demands of industry.